The graphic on the left represents the dilemma of the recording studio business. 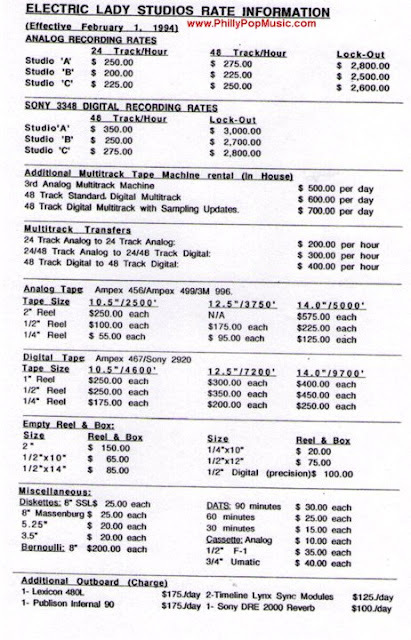 It's the legendary Electric Lady Studio's rate card from 1994 and it's evidence why so many legendary studios have been turned into condos. If you take notice, a lock-out rate (meaning the studio is purchased for the entire day) ranges from $2,500 to $2,800 a day. 16 years later, major studio rates are the same, even less if you get a deal. Now consider that the 1994 rates were about the same as in 1984 and you can see why being in the studio business is not a way to get rich quickly. 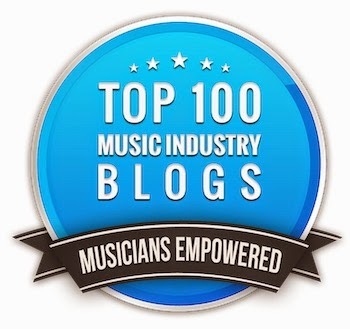 As the joke goes - "How do you make a million dollars in the music business? Start with 2 million." There was a silver lining back in 1994 though. The studio could make some extra dough on gear rentals and magnetic tape, as well as accessories like DATs, cassettes and automation backup media. Today, thanks to digital files, that extra income stream has fallen by the wayside. Everyone brings their own hard drives and CDs so it's hard to charge extra except for a vintage piece of gear. That's the reason why it just doesn't pay to get into the studio business on any level anymore. The costs to build the studio are more than ever, the cost of the real estate is still through the roof, and you can't even hope to be paid what studios where making 25 years ago, if you do happen to get a booking with a budget. So be thankful for the major studios that still exist like Capitol, Oceanway, Henson, Record Plant, Sunset Sound, Avatar, and Blackbird and lets hope that there's enough work left to keep them alive. As I've posted many times before, loudspeaker technology hasn't had a real technological advance in more than a hundred years. Sure, speaker science has evolved nicely to where it's very efficient and linear, but there hasn't been really anything that you'd call groundbreaking in a long time. We've seen novelties like gas modulated lasers, modulated flames, and vibrating membranes (which still might catch on in the future) that I've written about before, but finally there's something new that really shows some outside-the-box thinking. 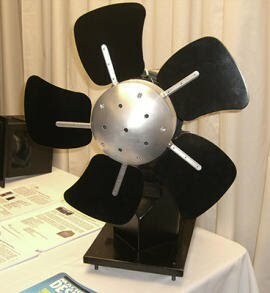 Eminent Technology's TRW-17 Rotary Woofer (pictured on the left) doesn't have a cone-type woofer or even cabinet; instead it looks like a fan or propeller, yet it reproduces frequencies down as low as 1Hz, and is powerful enough to be heard more than 3 miles away!!!!! High-end subs are lucky to make down to 18Hz, and the vast majority of subs won't even touch 30Hz on a good day. How does it do it? The TRW-17 really is a constant speed fan, but its blades are modulated up and down and side to side in order to generate sound. It's a wonderfully-simple design that makes you want to hit your head and say, "Doh!" As a result, the transducer (you can't call it a loudspeaker) can push far more air than any speaker/cabinet combination, and that lets it easily reproduce the 11Hz sound of a helicopter's rotor blades, the real infrasonic shock of an earthquake, or the rumble of everyday wind. If this system takes off, just wait and see how realistic movie sound finally becomes, or theme park rides, or war simulators. The downside? First of all, the TRW-17 Rotary Woofer retails for $12,900, but you have to build it into a room so it acts as an infinite baffle (a totally closed speaker system). Eminent Technology will take care of all that for you and add the amplifier and cross-over network, but it pushes up the price to $25,000. That being said, numerous audiophiles with too much disposable income have already installed the unit, but so have museum installations like Evergreen Aviation's Titan Missile exhibit and the Niagra Falls Welcome Center (you can see why this unit makes sense for them). It doesn't seem like there are any theater or pro audio installs yet, but expect some as the word gets out. You can read more on the technology behind the TRW-17 here. Here's another look at The Beatles rehearsing, this time learning a song during the filming of their Let It Be movie. The film hasn't been available since the 80's, Paul McCartney and Ringo Starr blocking its re-release due to the fact that it shows some of the dark sides of the band that they feel would hurt their image. The film put The Beatles in uncomfortable conditions, as they relocated to the cold (literally) Twickenham Film Studios and worked at early movie hours, which didn't meet with their lifestyles at the time. During the filming, George Harrison quit the band, only to return when the band agreed to move the filming to their own Apple studio. As you can see from Monday's Get Back rehearsal, their mood was lifted immediately. The song that you'll see here, Maxwell's Silver Hammer, would later appear complete on the Abbey Road album. 1) After Paul teaches the band playing the bass, he then moves to piano. George then fills in the bottom on a Fender Bass VI baritone guitar. 2) Ringo's drums go back to a more traditional miking technique for the time, with a mic on the kick, snare, and overhead. 3) Even The Beatles have feedback problems. Here's a compilation of rehearsals of The Beatles "Hey Jude". What you'll see is snippets of takes 7 through 25, although most of the footage comes from take 9. This recording was not intended for the final recording, but was supposed to be part of documentary regarding the song. Much of the what you'll see never made it into the film. In the middle you'll see George Harrison, producer George Martin, and engineer Ken Scott in the control room. George didn't have a part to play (reason unknown) so he chatted up Martin in the booth. 1) Once again, the boys are having fun. It's great to see people (especially our heros) have fun when they're making music. They do seem bored with the process however. 2) Ringo, as always, is his steady self. In most of these behind-the-scenes things, he's always the one no one pays attention to, mostly because whatever he plays just seems to fit. 3) Also notice the drums - the tea towels draped over the toms, and the miking technique. It appears that all of the drums are individually miked, which is unusual for the time. This week I have some great behind-the-scenes Beatles footage starting with a rehearsal for their hit "Get Back. " There are two versions - the top one is edited and has much better video quality, and the bottom one shows a bit more behind-the-scenes, but the quality isn't as good for either the audio or video. 1) The boys are having fun. There are a lot of smiles and laughs, which is contrary to the perceived mood of the band during this period. They are thoroughly enjoying themselves, which is what being in a band is all about besides the music. In fact, that's the thing I miss most from my band days; the camaraderie and the laughs. If you don't have that, you don't have a band. 2) Check out their rehearsal technique. They work out all of the parts quietly before they crank it up so everyone can hear. For those of you just starting out in bands, this is the way to do it.